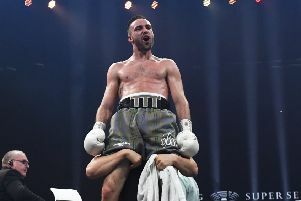 Undefeated boxer Tommy Philbin is adamant city rival John McCallum will have to look for an alternative opponent as he will be streets ahead of him after he’s won the super middleweight Celtic title in October. The 27-year-old, who has elected to move down weight division after claiming the British light heavyweight challenge belt at Meadowbank in June, was incensed by McCallum’s decision to withdraw from their scheduled bout on Friday, October 6, citing an injury – a move that will now see him face off against the current Scottish champion Rhys Pagan instead. But Philbin, who is searching for his tenth consecutive win since turning professional in 2015, insists his focus is now solely on Pagan for the Capital Collision bill at Meadowbank in little more than six weeks’ time. “John can say what he wants about getting the fight on later this year but that’s not going to happen. He’s had more than enough chances,” Philbin said. “He’s got nothing on me as I used to beat him up in the gym all the time. When the fight was made a few months ago he said he would be still beat me with an injury ... well why has he pulled out then? “He just talks absolute rubbish. I think he’s making the whole thing up. He’s been pictured on snapchat [social media] lifting weights in the gym so how can he do that if he needs an operation on his shoulder? Everybody knew he would pull out. I’m just glad it happened now so it gives Rhys Pagan the chance to properly prepare.